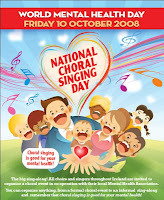 Did you know that singing is good for your mental health? Me neither, but that's how I ended up singing in the local shopping centre this evening with the Laydeez Choir! Hubs was dragged along as an (un)willing spectator with the promise that we could eat rubbish for dinner in the Food Court afterwards. As usual, it was a mad dash to get home from work, changed, layer on the slap, do the hair and back out the door within 20 minutes! We didn't do too badly considering there was only half of us singing, we forgot the words to one (ok, two) of the songs and couldn't hear ourselves because the acoustics were absolute rubbish. Hubs gave us the thumbs up anyway which is praise indeed! Then he was dragged off to do the food shop with me - not impressed at all. God love him - I have to do it every feckin' weekend and he thinks the Magic Food Fairy fills up the cupboards with stuff to eat!! !